Russia’s Federal Security Service has reported the detention of 25 Ukrainian citizens suspected of masterminding attacks on the territory of Russia, according to RIA Novosti news agency. 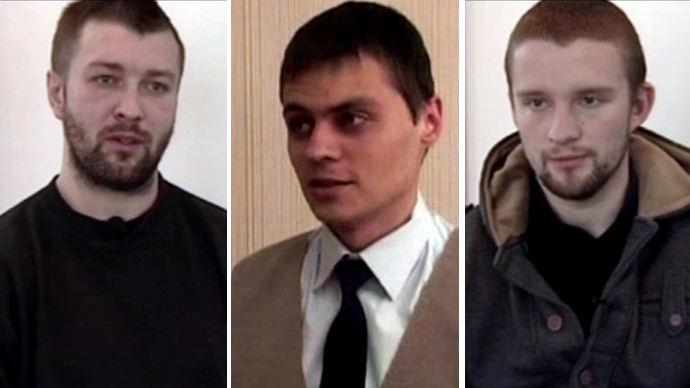 “Twenty-five people have been identified and detained as a result of measures performed in connection with the obtained information about the intentions of members of the so-called Maidan's Right Sector to carry out sabotaging and terrorist acts on the Russian territory between March 14-16, 2014 in seven Russian regions (Rostov, Volgograd, Tver, Orel, and Belgorod regions, as well as the Republics of Kalmykiya and Tatarstan),” a statement from the Federal Security Service said, as quoted by RIA Novosti. RT’s source in the security forces said that at least three of those detained were given orders by the Ukrainian Security Service (SBU) before being sent to Russia. Among those who gave them instructions was head of Right Sector’s personal security, S. Sereda, who received a high rank in the SBU following the coup in February, the detained parties reportedly said during the interrogation. According to the source, their mission was to photograph the deployment sights and movements of the Russian military in the regions bordering Ukraine. They were also tasked with studying the politico-social situation and arranging contacts with representatives of Russian radical organizations. Those detained worked in Russia undercover as employees of a Ukrainian firm which specializes in children’s photography. They were to pass the gathered data via internet and text messages, the source said. The SBU has denounced the claims that Ukrainians were planning terrorist attacks in Russia, calling them “nonsense,” Reuters reports. The Right Sector labeled the news “propaganda,” with radical organizations spokesman, Artem Skoropadsky, telling Interfax-Ukraine that if there are any Right Sector members in Russia they aren’t plotting attacks.